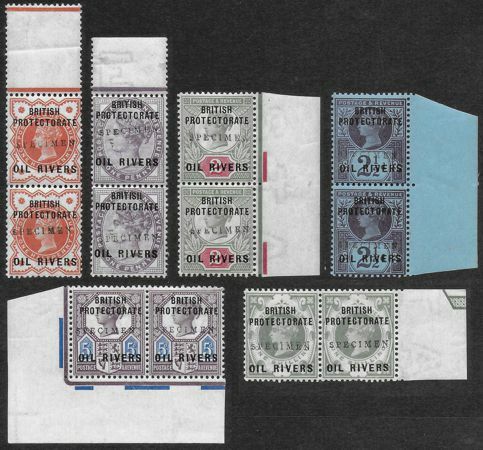 1892 Great Britain 'Jubilee' issue ½d, 1d, 2d, 2½d, 5d and 1s (this with part of marginal ornament) set of 6 in superb marginal pairs overprinted BRITISH / PROTECTORATE / OIL RIVERS and handstamped SPECIMEN Samuel type GB13. Preserved by De La Rue as colour standards and extremely rare even as single copies. SG1/6s.